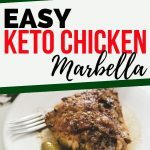 Low carb keto Chicken Marbella is just as delicious as the original but sugar free! Great for an easy keto dinner, and a perfect low carb dinner party recipe! I admit this low carb keto Chicken Marbella recipe is probably 99% self-serving. I love love love Chicken Marbella but the original recipe has SO.MUCH.SUGAR. What a blood sugar roller coaster that would put me on. So I finally decided to make it keto-friendly so I could enjoy it again. Then I got to thinking that maybe there are others following a keto diet that miss it too! Is that you? The traditional Chicken Marbella recipe includes LOADS of sugar. In this recipe, we’re adding strong plum tea to the marinade as a substitute for the prune flavor. In place of the brown sugar, we’re using brown swerve. 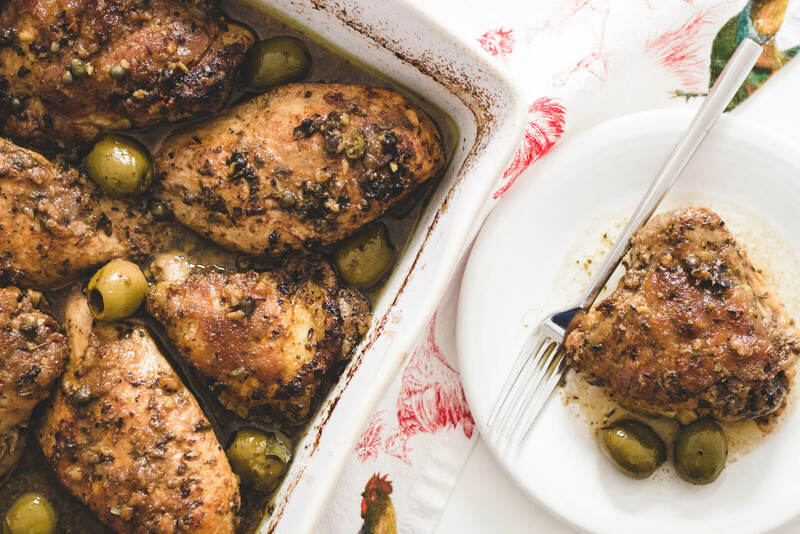 In this keto Chicken Marbella adaptation, we’re searing the chicken pieces on the stovetop and deglazing the pan with the white wine before baking. This browning creates a much richer flavor. I’ve also cut the size of the recipe way down so it works better for a family dinner. The original recipe called for four whole chickens! I love leftovers, but that would be too much for our family. Despite its name, Chicken Marbella famously isn’t Spanish. It was created by New York caterer Sheila Lukins and her business partner Julee Rosso, and published in the Silver Palate cookbook in 1982. While there are many stories about the partnership dissolving, you can read more about Sheila Lukins iconic career in her 2009 NYT obituary. 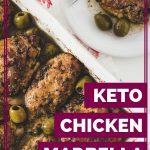 Can I Make Keto Chicken Marbella With Boneless Chicken or with Thighs? Sure can! Traditionally, the recipe calls for quartering whole chickens. I’ve written this adaption to use chicken pieces (bone-in thighs and breasts), and you should feel free to use whichever cuts of chicken you prefer. My grocery store is often out of ethically raised bone-in chicken breasts, so I’ve tried everything from bone-in skin on to boneless skinless. All are delicious. If you’re throwing a low carb dinner party, try a variety of bone-in thighs, breasts, and drumsticks. If you’re cooking dinner for your family just make it easy and buy the cuts your kiddos will eat! In a large bowl, combine garlic, red wine vinegar, avocado oil, plum tea, olives, capers, oregano, bay leaves, salt, and pepper. Add chicken and toss to coat with the marinade. Allow the chicken to marinate for at least 60 minutes, or as long as overnight. Sear the chicken pieces in a large saute pan over high heat, reserving the marinade. Transfer the chicken pieces to a 9x13 casserole dish and pour the reserved marinade over the top. Deglaze the saute pan with the white wine, scraping up the browned bits and pour the pan drippings over the chicken. Sprinkle the brown swerve over the top of the chicken pieces. Bake the chicken at 375 degrees F for 30-45 minutes, until the chicken reaches an internal temperature of 165 degrees F. Optionally, sprinkle the italian parsley over the top. 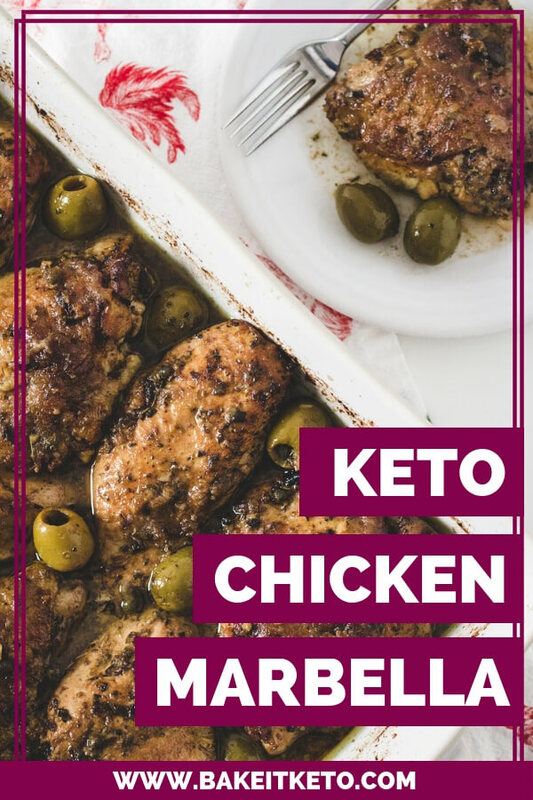 WANT TO SAVE LOW CARB KETO CHICKEN MARBELLA RECIPE FOR LATER? CLICK HERE TO PIN IT TO YOUR FAVORITE KETO PINTEREST BOARD!